This is a joint message from Thoth and the Sirian High Council. As it is rather long message, I am presenting it as a series of short paragraphs for your easy reading. To allow for an optimal integration of these coded words into your energetic field and subconscious mind, please read this important message slowly and patiently. 1. Thoth transmitted this message in his capacity as the architect and gate-keeper of the Hall of Records, a hidden chamber beneath the Sphinx. 2. Goddess Isis represented the Sirian High Council in delivering this message and the activation codes. She is a light being originated from the Sirius Star System of the 6th dimension. 3. The Hall of Records resides beneath the Sphinx, in a space between its two paws and directly below its third eye. The Hall of Records stores the Divine Plans for Earth and the Solar System, and the collective memory of mankind. These records are kept as vibrational sound patterns encoded in the walls of a small physical chamber found beneath the Sphinx. 4. Every thought that has ever been generated by man and projected into the Earth realm was captured as a sound pattern and locked in the Hall of Records. Each of these sound patterns in turn carries a specific light quotient or energy frequency. A loving or positive thought is calibrated with a higher energy frequency compared to a fear-based or negative thought. 5. By the end of the current evolutionary cycle (of 26,000 years) when Earth is ready to transit to the 5th dimension of light, the corresponding ascension of mankind as a specie will depend on (i) the light quotient accumulated in our combined memory or akashic records; and (ii) the consolidated energy frequency of the thoughts we hold collectively on the day of the dimensional shift i.e. 21.12.2012. 6. Ascension of mankind means achieving an evolutionary stage where all residual negative karmic imprints or lower-quality sound patterns in our shared akashic are being transmuted and restored as God consciousness. Mass ascension precedes the physical manifestation of a heavenly Earth. This is to say whilst Earth as a living consciousness can and will be elevated to the 5th dimension come 21.12.2012, not all of mankind will experience or manifest this vibrational shift externally. 7. Within mankind’s collective memory or akashic records, there is the individual soul’s akashic. Although related to each other, ascension of the soul can be attained independently of the mass ascension of humanity. We, the human incarnates, exist on Earth as the physical expressions and vessels of our souls. If, through our numerous physical incarnations, we have built up sufficient light quotient or positive karma in our akashic, our souls will then ascend along with Earth. This is to say our souls would no longer need to incarnate, learn and evolve through this physical school, after the current incarnation. 8. 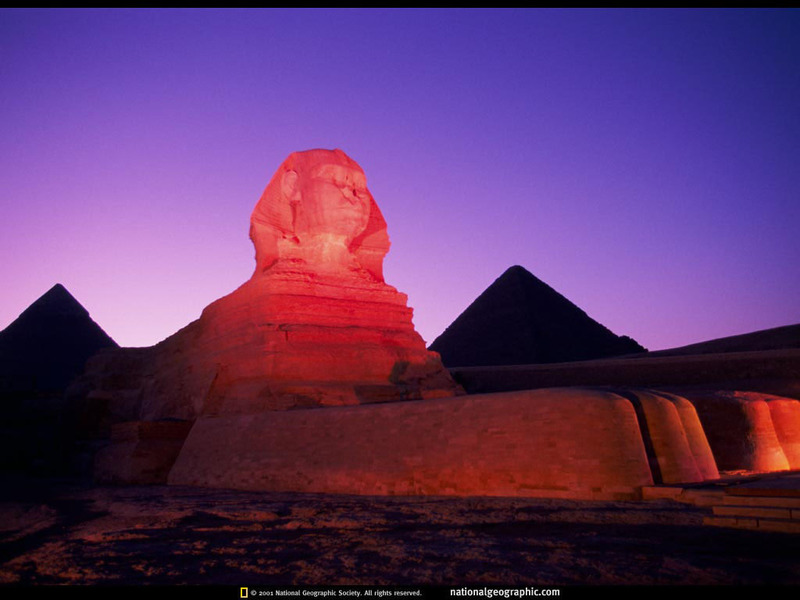 Within the third eye of the Sphinx lies a prism of living light. When activated on 21.12.2012, this prism which serves as a switch, will spark off the transmission of a series of sound, light and geometric codes across the Giza plateau, activating the three pyramids on Giza which are energetically connected to the network of pyramids on Earth. The symphony of galactic sounds so released throughout Planet Earth at that moment is The Shift propelling the awakening of mankind. 9. Between 8:00 pm on 20.12.2012 to 8:00 am on 21.12.2012 Cairo Time (or 6:00 pm on 20.12.2012 to 6:00 am on 21.12.2012 GMT/UTC) , the Earth and the Sun will slowly move into perfect alignment with the Central Sun (Heart of Pleiades System) and the Great Central Sun (Galactic Core or Heart of Sirius System). At 8:00 am on 21st Dec in Cairo, the time of the Galactic Alignment, when the Sun rises to shine upon the Sphinx, a spectrum of light* will radiate from its third eye (prism) to open the Hall of Records and activate the sound chambers hidden in the three pyramids on Giza. See diagram above. 10. The Hall of Records will become inaccessible for the purposes outlined below after 2:00 pm on 21.12.2012 Cairo Time (or 12:00 pm on 21.12.2012 UTC/GMT). 10. Within this window period, you may ask to ‘enter’ the Hall of Records to access your soul’s akashic records for a quicker remembrance and actualisation of your soul knowledge and wisdom, as well as for an expanded understanding of your soul’s journey and divine blueprint. 11. If you choose to do so, you can make use of this opportunity to uplift the collective akashic of humanity by holding positive loving thoughts while you are in the Hall of Records. Read para 5 above for the intention. 12. Click HERE for guided meditation and activation codes gifted by Thoth and Isis respectively, for entering the Hall of Records. 13. Thoth revealed that only initiates and light workers who have developed sufficient light quotient in their spiritual bodies and re-connected with their soul light will be able to access the Hall of Records properly, using the protocol provided by Thoth (para 12). On behalf of the Great White Brotherhood who has upheld the divine plan for Earth in the last 26,000 years (5 World Ages), I thank you for holding positive loving thoughts and shining your light onto the consciousness of man.